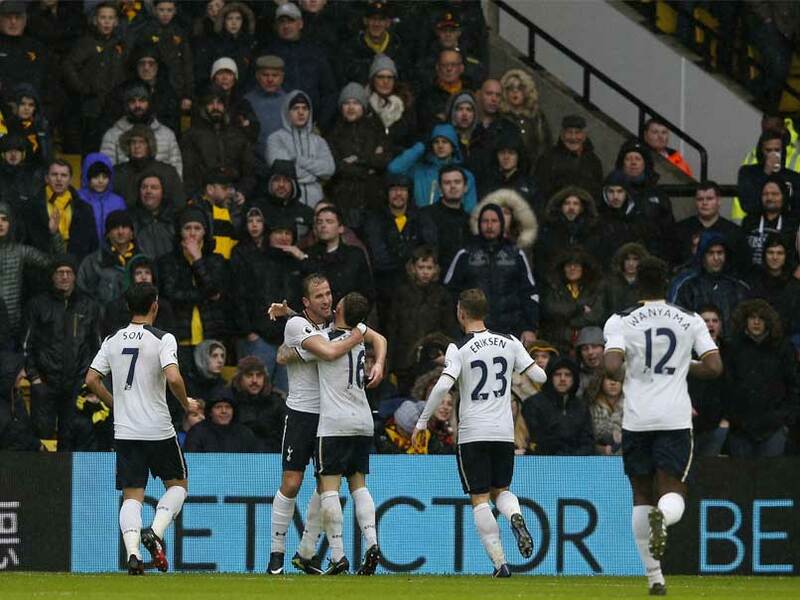 Tottenham Hotspur recorded an impressive 4-1 win at Watford on Sunday that sent them above Manchester City on goal difference and into the top four of the Premier League. An injury-weakened Watford side put up little resistance as two goals by Harry Kane and another from Dele Alli gave Spurs a 3-0 half-time lead. Alli scored again early in the second half before manager Mauricio Pochettino took off his scorers ahead of the match against leaders Chelsea at White Hart Lane on Wednesday. Younes Kaboul smuggled home Watford’s injury-time reply with their only shot on target. Chelsea are 10 points ahead of Pochettino’s men, but Spurs will remember all too well that it was at Stamford Bridge that their title hopes were finally ended last season. Chelsea played above themselves to deny their North London rivals the win they needed to maintain their pursuit of Leicester City. Now Tottenham will be keen to end Chelsea’s bid for a record 14th successive victory. If that promises to be one of the matches of the season, the New Year’s Day game at Vicarage Road was more like a light training exercise in comparison. Watford have now lost five of their past seven matches and never looked likely to get anything from this match. Head coach Walter Mazzarri was without nine first-team players after Camilo Zuniga was injured in the warm-up and had to be replaced by Odion Ighalo. Tottenham, in contrast, were only without the suspended defenders Jan Vertonghen and Kyle Walker, but welcomed back Toby Alderweireld after his recovery from a virus. They went straight onto the attack and Song Heung-Min tested ex-Spurs goalkeeper Heurelho Gomes with a skidding 25-yard shot. After 10 minutes a first-time effort by Christian Eriksen hit the raised arm of Etienne Capoue, another former Spurs man, only for referee Michael Oliver to turn down the visitors’ penalty claims. Tottenham then produced a move of quality as Alli dummied Eriksen’s square pass to give Danny Rose a shooting chance, but his right-foot effort sailed high into the stand. Eriksen shot marginally less high, but Spurs were getting closer and in the 25th minute Alli collected a loose ball and let fly from 22 yards, the ball rebounding back from the angle of post and crossbar. Spurs would not be denied and took the lead in the 27th minute. Kieran Trippier’s pass from the right sent Kane through to advance towards the near post and hit the ball between Gomes and the upright. A second followed just past the half-hour. Again Trippier was the provider, with Kane charging between defenders Craig Cathcart and Sebastian Prodl to volley the full-back’s cross home with the outside of his right foot. It should have been 3-0 to the visitors six minutes before the interval as Watford failed to react to Eriksen’s free-kick to the near post. However, Son volleyed wide with Kane unmarked behind him. But it was 3-0 two minutes later. Yet another former Spurs player, Kaboul, miskicked as he tried to clear Kane’s deflected cross from the left and Alli beat Cathcart to the ball before rolling it past Gomes. Alli got his second in the opening minute of the second half, gathering a cross from England colleague Kane and squeezing the ball past Gomes with his left foot. It seemed Tottenham could do as they pleased, so it was a surprise when Son passed up several chances to add to the score, and Watford hardly celebrated when Kaboul forced home from a late free-kick.